The prevalence of diabetes in pregnancy has been increasing worldwide. Most of the prevalent form being gestational diabetes mellitus (GDM); with the remainder primarily pre gestational type 1 diabetes and type 2 diabetes. Both pre gestational type 1 diabetes and type 2 diabetes confer significantly greater maternal and foetal risk than GDM,with some differences according to type . 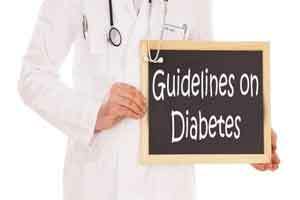 In general, specific risks of uncontrolled diabetes in pregnancy include- spontaneous abortion, foetal anomalies, pre eclampsia, intrauterine foetal demise, macrosomia, neonatal hypoglycaemia, and neonatal hyper bilirubinemia, among others. In addition, diabetes in pregnancy may increase the risk of obesity and type 2 diabetes in the offspring, later in life . Provide preconception counselling that addresses the importance of glycaemic control as close to normal as is safely possible, ideally A1C ,6.5% (48 mmol/mol), to reduce the risk of congenital anomalies. Family planning should be discussed and effective contraception should be prescribed and used until a woman is prepared and ready to become pregnant. Women with pre existing type 1 or type 2 diabetes who are planning pregnancy or who have become pregnant should be counselled on the risk of development and/or progression of diabetic retinopathy. Eye examinations should occur before pregnancy or in the first trimester and then be monitored every trimester and for 1 year post partum as indicated by degree of retinopathy. Lifestyle change is an essential component of management of gestational diabetes mellitus and may suffice for treatment for many women. Medication should be added, if needed to achieve glycaemic targets. Preferred medications in gestational diabetes mellitus are insulin and metformin;glyburide may be used but may have a higher rate of neonatal hypoglycaemia and macro somia than insulin or metformin. Other agents have not been adequately studied.Most oral agents cross the placenta, and all lack long-term safety data. Potentially tera togenic medications (ACE inhibitors, statins, etc.) should be avoided in sexually active women of child bearing age who are not using reliable contraception. Fasting, pre prandial, and postprandial self-monitoring of blood glucose are recommended in both gestational diabetes mellitus and pre gestational diabetes in pregnancy to achieve glycaemic control. Due to increased red blood cell turnover, A1C is lower in normal pregnancy than in normal non pregnant women. The A1C target in pregnancy is 6–6.5% (42–48mmol/mol);,6% (42 mmol/mol) may be optimal if this can be achieved without significant hypo glycaemia, but the target may be relaxed to ,7% (53 mmol/mol) if necessary to prevent hypoglycaemia.